The Peruvian Inca Orchid is an exotic blossom from the Andes: a sighthound that comes in hairless and coated varieties. The breed’s name in Quechua, the language of the Incas, translates to “dog without vestments,” or naked dog. The Peruvian Inca Orchid is a breed of dog native to Peru, and although the breed is most famous for being hairless, some breed members are born with a full coat of hair. A truly ancient dog, Peruvian Inca Orchids were already well-established in their homeland prior to the expansion of the Inca Empire. The Inca and some of their descendants believed that their hairless dogs possessed spiritual powers, and maintained the breed for many centuries. Although still rarely seen outside of Peru, the dog has been attracting an increasing following in the West, including the United States. The Peruvian Inca Orchid has been declared a National Patrimony by the government of Peru and is widely considered the country’s national dog. Like the better known Xoloitzcuintli of Mexico, the Peruvian Inca Orchid comes in three sizes; small, medium and large. The PIO’s skin or fur can be any color, including black, brown, gray, pink, tan, or white. The PIO is a medium-size sighthound. Hairless and coated dogs can be born in the same litter and differ only in ear carriage, with the coated dogs having semiprick ears. This is an ancient breed. Although it is often perceived to be an Incan dog because it is known to have been kept during the Inca Empire , they were also kept as pets in pre-Inca cultures from the Peruvian coastal zone. Ceramic hairless dogs from the Chimú, Moche, and Vicus culture are well known. Depictions of Peruvian hairless dogs appear around 750 A.D. on Moche ceramic vessels and continue in later Andean ceramic traditions.The main area of the Inca Empire (the mountains) is too cold for the natural existence of hairless dogs. While they were commonly eaten in ancient times in the northern coastal areas of Peru the Inca prohibited the consumption of dogs when they conquered that region. The Spanish conquest of Peru nearly caused the extinction of the breed. The dogs survived in rural areas where the people believed that they held a mystical value, and because of their reputation to treat arthritis. In recent years, the Fédération Cynologique Internationale (FCI) accepted the breed and adopted an official breed standard. 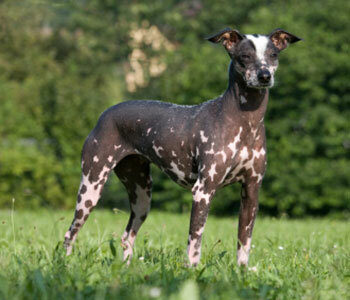 Before that time, in the United States, some enthusiasts created another type of Peruvian hairless dog, the Peruvian Inca Orchid. The Peruvian Inca Orchid is recognized by the AKC, and all recognized dogs are descendants of 13 dogs brought from Peru in the early 20th century. The club UKC also recognized the breed in recent years. 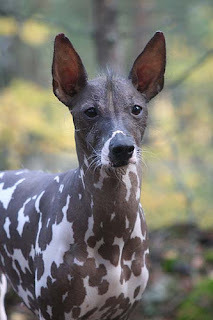 The Peruvian Inca Orchid, also called the “PIO,” is a lively, alert, inquisitive sighthound that plays well with other dogs and is easy to live with. The PIO’s temperament is similar to that of a Whippet. They are loyal and affectionate to their family members and make excellent companions. These are sensitive dogs that are best suited for homes with adults and older children. They are instinctively protective and defensive around unfamiliar people and dogs. Because they are suspicious of strangers, PIOs make good watch dogs and guard dogs. They don’t appreciate being left alone for long periods of time and do best having at least one other canine friend in the family. These are active, agile, athletic animals that probably aren’t the best choice for first-time dog owners. However, with experienced owners, they can be alert guardians and friendly companions all in one package. It is very important to start socializing and training PIOs at an early age, so that they grow into stable, reliable adults. Mature PIOs are generally calm, quiet, smart and somewhat independent. They are devoted to their owners, reserved with strangers, but rarely aggressive. Like other hairless breeds, the Peruvian Inca Orchid can sometimes suffer from various dental issues. This is a result of the hairless gene that sometimes causes the dog to have fewer teeth than other breeds. They also sometimes suffer from epilepsy and pancreas inflammations. Peruvian Inca Orchids, like all hairless dogs, are extremely prone to cuts, bruises and skin irritations. Therefore care should be taken to moisturize the dog’s skin regularly to keep it soft and supple. The PIO will do OK in an apartment. A fenced-in yard is recommended as the PIO is a sighthound and may take off chasing a small animal at any time. This breed should live indoors and be protected from the elements. The PIO sunburns very quickly. It should have a sweater in the winter and be kept at a comfortable temperature in the summer. Keep in mind this breed does not have hair to protect it from the weather and is basically naked. PIOs are smart, alert, attentive and trainable. They usually learn standard obedience commands and household manners fairly easily. They can be a bit rambunctious, but still typically are fast learners, especially when trained with reward-based positive reinforcement techniques rather than harsh, loud verbal or physical corrections. PIOs do best with multiple short, fun training sessions instead of single long training sessions, to prevent boredom, distraction and loss of interest. They can be quite protective of toys, food and people. Consistent training from a young age is necessary to teach PIOs proper doggy etiquette. Like any hunting breed, Peruvian Inca Orchids require a great deal of rigorous exercise. They can often run at extremely high speeds for long distances. Responsible owners should make sure that their dogs get enough physical activity each day to drain their energy levels. A failure to do so can often result in an unhappy and sometimes destructive dog. The grooming requirements of the Peruvian Inca Orchid are minimal, but there are some special considerations for this hairless breed. If he has furnishings, brush weekly with a very soft brush. Wipe the skin daily with cloth dampened with warm water to remove dirt. A bath with a mild dog shampoo once a week or every few weeks helps keep the skin blemish free. Apply moisturizing lotion daily, or as needed, depending on skin condition and climate. 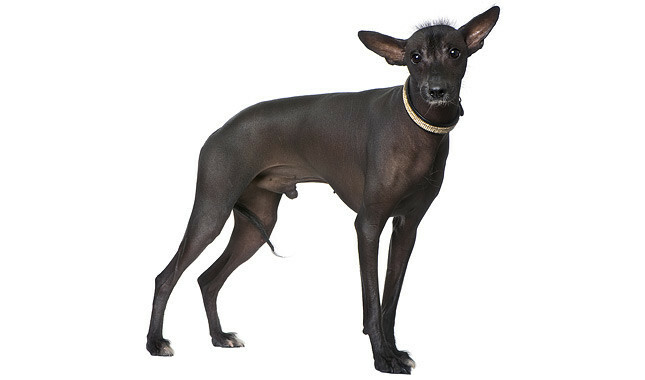 Some hairless breeds are sensitive to lanolin, so ask the breeder what lotion she uses on her dogs. His ears need to be checked every week and cleaned if needed, and toenails trimmed every few weeks. Regular tooth brushing with a soft toothbrush and doggie toothpaste keep the teeth and gums healthy. Hairless breeds are prone to sunburn so apply sunscreen or dress him in a doggie T-shirt. Is the Peruvian Inca Orchid the Right Breed for you? Low Maintenance: Infrequent grooming is required to maintain upkeep. No trimming or stripping needed. Easy Training: The Peruvian Inca Orchid is known to listen to commands and obey its owner. Expect fewer repetitions when training this breed. The Spanish conquistadors, who are said to have found these dogs living amidst orchids in Inca homes, called them “perros flora”: flower dogs. 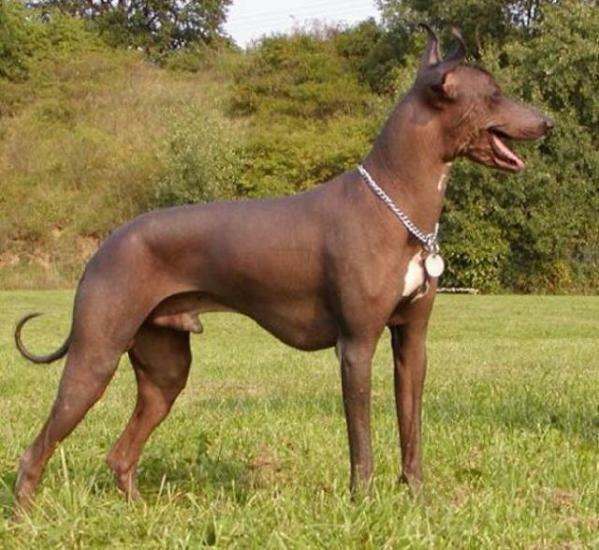 They are also sometimes called moonflower dogs, Inca hairless dogs, and Peruvian hairless dogs.